It seems intuitive – all you need to do is take an arrow, point it at the target, pull, and shoot. When broken down like that, shooting a traditional bow and arrow sounds easy. Except it’s not that easy and the complexity of shooting a traditional bow and arrow is a skill that takes time to master. With patience though, anyone can learn how to be an excellent archer. Shooting a bow and arrow requires a good amount of practice and the best archers are those who can shoot and hit the target without seeming to try. This level of mindfulness is very Eastern, but the reality is great archers are almost in a meditative state when drawing and shooting. But we are here to learn how to shoot, and it will take practice to get to that stage. 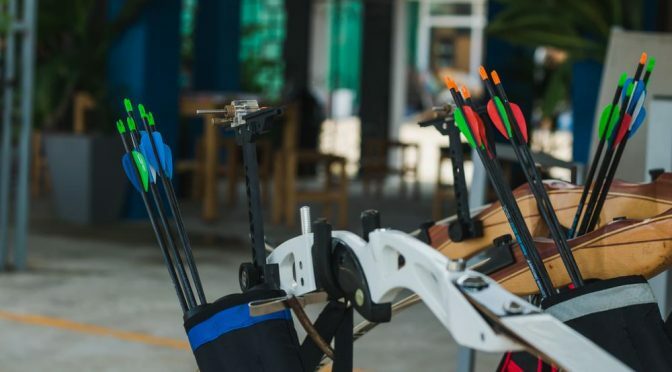 With traditional bow and arrow shooting, there is no modern convenience like an arrow rest for a compound bow, that’s why it’s important to learn the mindfulness of shooting. The building block for great archery is the stance. There are two types of stances, the closed and open stance. The difference is what the lead foot is doing. In the closed stance, the feet are both parallel to the target, making the lead shoulder point directly at the target. For open stances, the lead foot isn’t quite perpendicular to the target but is at a 45-degree angle between the back foot and the target. The open stance should be used as you gain experience. A closed stance ensures that you will use your back muscles to draw the arrow instead of bending your body to draw it. Start with a closed stance first, this will help you consistently set up and hit the target with regularity as you increase distance. Once you feel comfortable, use the open stance on uneven ground or where there are obstructions. However, remember, this stance is to be used after developing the coordination and familiarity with the actions of drawing and shooting the arrow. When shooting, consistency is vitally important to the success of your shots. That’s why nocking the arrow is so vital to success. When you nock an arrow, you place the shaft of the arrow on the bow itself. The nock of the arrow is at the back, this is a grooved-out space that is designed to fit on the string. There are a couple ways to tell where the nock is on your bow. The single nock system is where you have just one bead on the string. The key here is placing the arrow just below the bead. On a two-bead nock system, place the arrow in between the beads. Once the arrowis nocked, the nock itself will surround the string, making it easier to draw the arrow. Making sure to grip the bow correctly is a key part of shooting. You should draw the arrow with your dominant hand, and your non-dominant hand should grip the bow. There are a few things to look out for. When you grip the bow, make sure you do so in a way that the pad of your thumb has the bow resting on it. If you don’t have this, then the torque of your twisted arm will throw off the arrow’s accuracy. Furthermore, the action of the string will whip your forearm causing pain. There is a key indicator to knowing if you’ve gripped the bow correctly – your knuckles. If your knuckles are at a 45-degree angle from the bow, then that means your thumb pad is most likely resting on the bow. Your arm will be out of the way and shooting will be much easier. Gripping the bowstring is also important. Use the Mediterranean grip if you’re a beginner. This grip just involves your index, middle, and ring fingers. Grip the string so that the nock is between your index and middle fingers. This allows you to have ideal control of the arrow. Now comes the fun part. The first step is raising the arm holding the bow to shoulder height. Once it is there, it is time to draw the arrow. The key to a good draw is not to use your arms. Use your back muscles. The key to remember is to squeeze your shoulder blades together. This will pull your arm back naturally and distribute the weight of the draw evenly across larger muscles. If you attempt to just use your arms, you will tire quickly as those muscles are not designed for the heavy moving that is a draw. The anchor is the reference point on your face for where your draw ends. For some folks, this could be the cheek or the nose. Whatever your anchor point is, once you find one that you’re comfortable with, do not deviate from it. This will ensure that you get the right draw each time, instead of inconsistent draws that lead to poor shooting. Again, the key with aiming is not to over-aim. Don’t spend a lot of time finessing the target. You will miss and get frustrated. Simply point the arrow at the target – no more, no less. Once you have aimed the arrow, it is time to shoot. The key to getting an optimal flight on the arrow is the follow through. The release is just using your fingers to push the bowstring forward, but you must keep pulling your hand back all the way past your ear as you release. This follow-through will have the bow slide up, but that’s ok. The arrow will fly true and hit the target. Make sure you do this consistently. The key to shooting a traditional bow and arrow is practice. Keep practicing and working on your technique. Don’t sweat the aiming. This will come with time. Focus on all the other elements of shooting and soon, you’ll have no problem hitting the target.